Here we talk about choice of qualitative shareware audio converter. What issues of high resolution audio conversion tools? We have three issues. Noise of shifted ultrasound is noise (intermodulation distortions) appearing due non-linear distortions of analog part of audio gears for playback of HD (88/96/176/192 kHz) files. Restricted range of built-in output formats - downloadable HD audio files have FLAC, WAV, AIFF formats. High resolution and professional conversion software usually support a restricted number of output formats. Formats wma, mp3, alac and other (used for hi-end mobile audio devices - portable and car systems) don't supported. Final conversion to destination format we make manually. Mac starting with Win emulation software - many producers and audiophiles use Mac. Some high qualitative audio conversion utilities has Windows version only. Which can offers audiophile programs for resolution ( sample rate and bit depth) converting of lossless files with user friendly interface? Now about decission these problems. 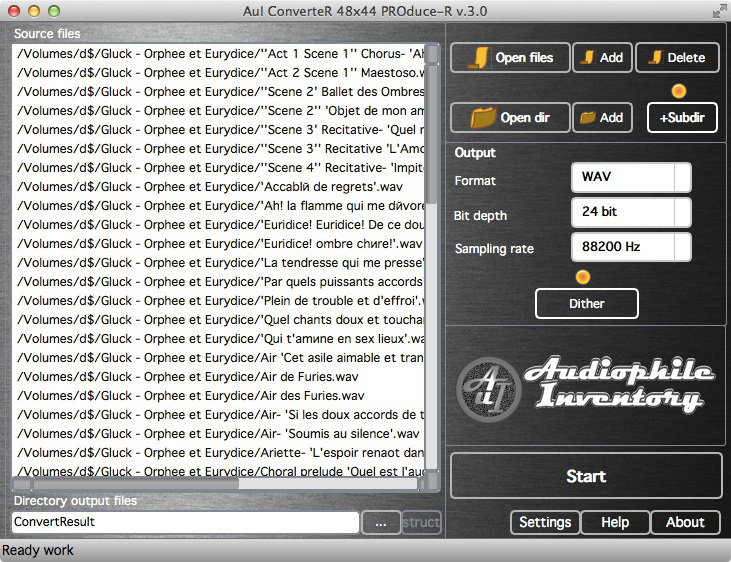 AuI ConverteR 48x44 is audiophile converter specially designed for high resolution lossless files. - 64-bit float all internal sound processing. Suppressing whistle and noise of shifted ultrasound with alphaC sample rate conversion algorithm. User customization of output files formats - after resolution converting automatically starting of command line encoders by third-parties developers. You can connect your encoders off one's own bat.